Lo and behold, after weeks and weeks of looking, Target finally stocked a new point of purchase set. The Imperial Shuttle was very exciting to see hanging on the shelf, crowding out a few City helicopters and Chima sets. Though my nerd cred is a bit low, Star Wars is still one of my favorite themes. 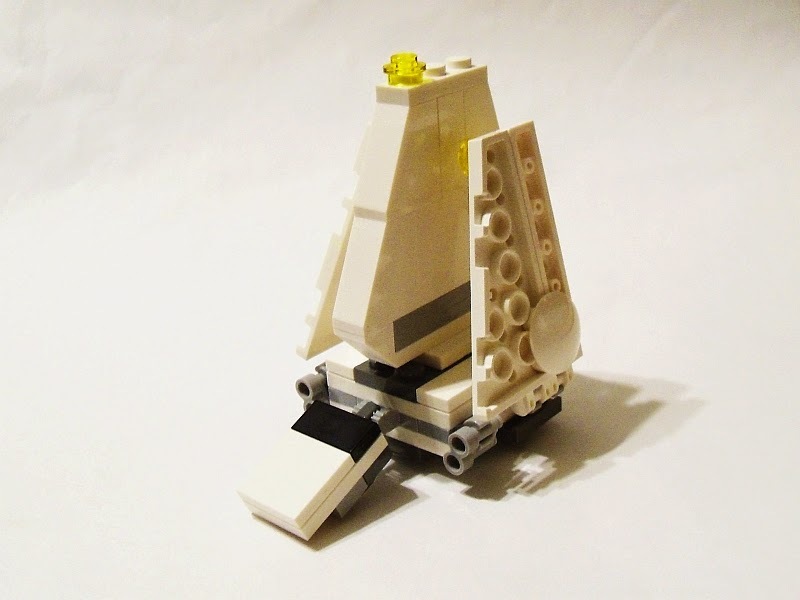 Aside from the Advent Calendar mini, this would be my first little shuttle. I know that I've generally been a little hard on these small sets in the past. And well I should be. There's no reason not to get every bit of value out of a $5 set as you do a $50 set. Thankfully, this set has many more positive things to say about it than negative ones. First off, it's a great white parts pack. 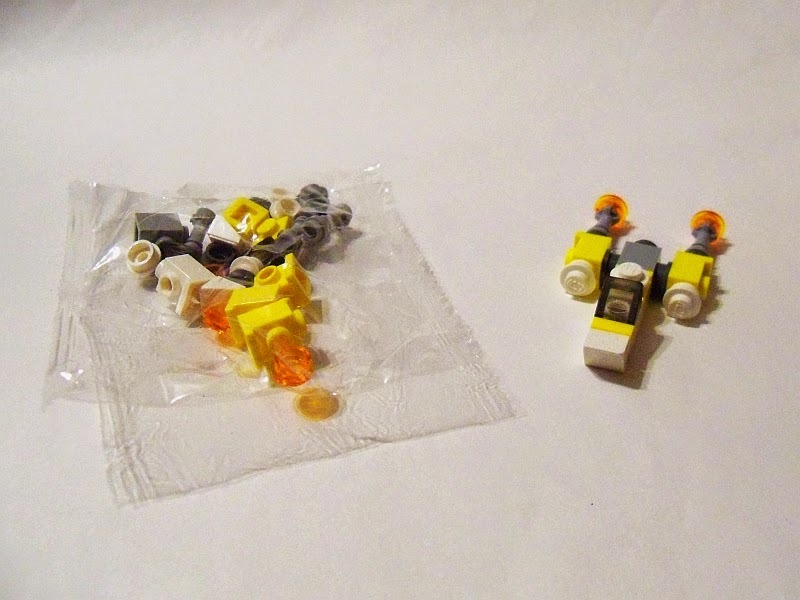 There are several standard pieces plus some nice little greebles and functional bits in the staple color. Also a few nice basic dark and light bley bits. But this is only the beginning. The shaping is very impressive in a small model. I only have a few small complaints. First, it's not stable to set down with the wings out. It'll need a stand if you want to display it in flight mode. This is more difficult than it sounds since the bottom is all but plastered in boat studs. Second, the wings don't really show the small bit of an angle near where they connect to the body. This, really, is minor. Finally, the cockpit looks a little flat. The slope piece from the BrickMaster version was perfect but any slope on this model would be a touch too big. Ideally, there would be a 3x2x2/3 slope. That would nail it. But that's about it for the low points. For the high points it has a nice design, sturdy build, and play features! That gigantic tail (back?) wing is a big mass of white pieces that is spot on for the real thing. Maybe missing a few lines of color here and there but the shape is perfect. 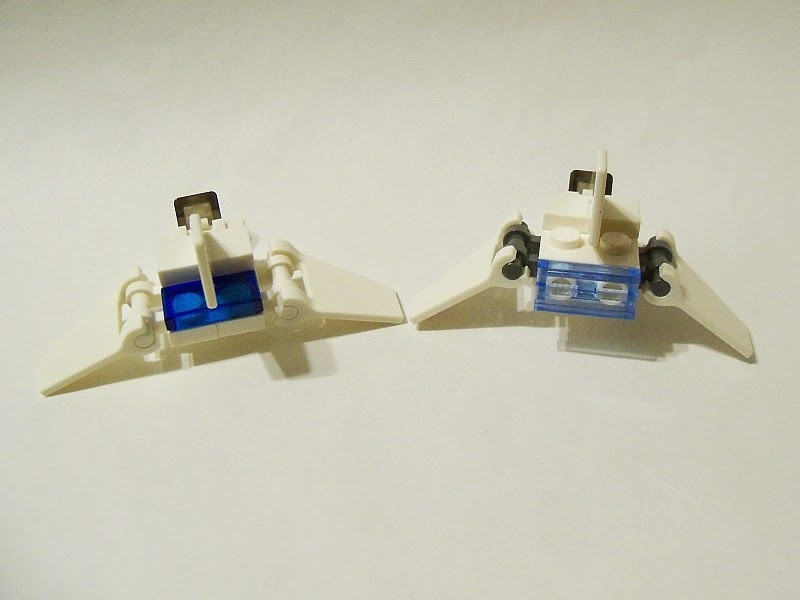 The wings are the same basic shape and design as used on many other Star Wars miniatures, just turned 90° or pieces on top of instead of underneath other pieces. But everything is solid and highly highly swooshable. And what about the play feature, you ask? Well, should your tail wing get blown off in space (which is not improbable when swooshing this around; that connection could be tighter), you can launch the cockpit with your top classified crew members and get out of Dodge. 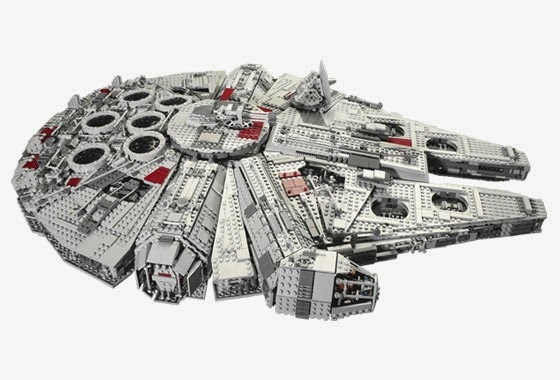 It seems all the rage now is to build a UCS Millennium Falcon by purchasing all the pieces on the secondary market. This could be a good idea but look at the costs. As of this writing a new Falcon will set you back around $3,000 while a used one can be had for around $1,500-$2,000 in varying conditions. So let's buy the pieces and put one together, easy right? 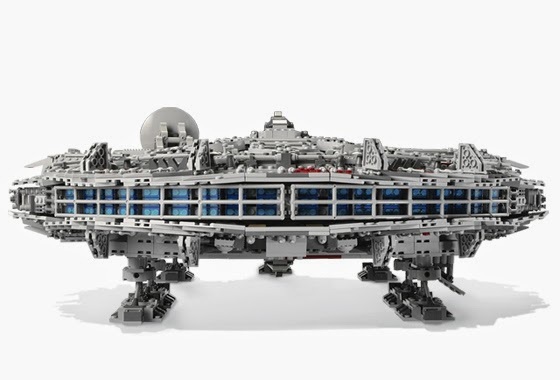 According to the Bricklink part-out feature, the average price of the parts comes to $2,700. Of course items don't get shipped on love alone so add another 12% to account for postage. We're up to $3,000 assuming all the pieces can be had for average. No box or instructions. Might as well just buy new, right? But maybe there's another way. What if you just want to own one and don't care about reselling? What if you could substitute some rare pieces for more common ones or pass on others altogether? What kind of savings would you see? And how do you do this? First, download Brickstock. Install. Run. The first thing you need to do is go to Extras -> Update Database. This will bring your copy up to date with all the pieces, inventories, and minifigs. Then go File -> Import -> Bricklink Set Inventory. Set Item Type to Set, type 10179 into the filter and click [All Items]. Once the set pops up, double click it. The entire inventory will load on the screen. Could take a minute. Now we need to know prices. Press Ctrl-A then Ctrl-G then Enter. This will load the average prices of all the parts. Watch the numbers grow in the upper left corner. When it is finished you will get a pop-up screen. Click OK. Note the value. Mine currently says $2679.90. Now comes the fun part. Click the Price column, probably twice to get the most expensive items at the top. Scroll up. What's that first item, a certificate of authenticity? You don't need that, it's $275 and this isn't going to be authentic. Select and delete. The next item is a big sticker for the set. This sticker goes on a plaque and isn't even part of the ship. At $223 you can strike it. The next item is a boat mast rigging in light bluish grey. They're $122 a piece and you need two. Want to save $220? Double click the color and change it to black. Hit Ctrl-G again and see what happens. Now it's $8 each. Go buy some paint or call it good as is. Three items modified or deleted and we're already under $2,000. See, I just saved you almost $700. 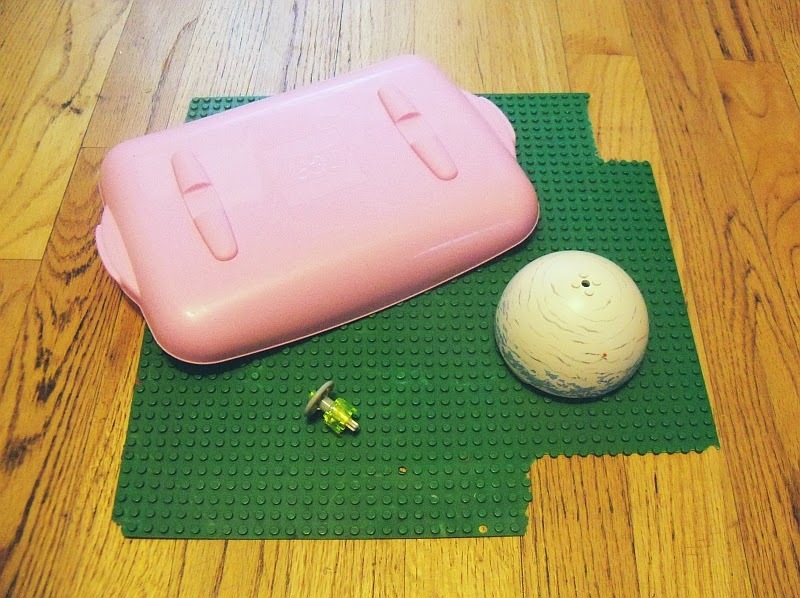 Now you can buy some of my Dag Brick instructions to thank me. But we're not done yet. The fourth item is a radar dish that has some sort of printing inside it. The decoration is nice but for a cheaper version we're going to rename this part. Double click on the '50990pb03' and change it to read '50990b' This gets rid of the decor and changes the dish to one with solid studs instead of hollow studs. Really, who's going to notice the studs since they're facing down? Hit the magic Ctrl-G and watch the price drop from $80 to $2. Next are five minifigs worth about $48. It's your choice but for the purpose of this guide I'm going to strike them. The next sticker is superfluous and at $8.50 is not important enough to the build. Gone. The dark red 6x14 plate is not terribly visible and could be substituted for light bluish grey or dark bluish grey dropping the price from $16 to a buck or two. There are two parts that have a little number next to them. This is called a Match ID. It means that there is a variant to the part that is functionally similar and possibly cheaper. Select the Technic, Pin Connector and then click on the description column. It will show up next to it's mate. One type is over $4 each. The other newer type is 12c each. There is no functional difference. Since you need 41, I HIGHLY suggest you remove the $4 one. This will save $65 in this one part alone. Click the Price column twice, scroll to the top and repeat for the Bar 6.6L. There's a similar per part price differential over 28 units. The only caution here is whether or not the extra 0.6L is needed. You can always build it with the shorter version and see what suits you. At this point we've shaved about another $500 off the price but I've still got a few more tricks to play. There's a light bluish grey lever with a light bluish grey base. And not just one but 60 with 2 extras. It will change the finished look a little but you can always change the part number to 4592c02. This changes the lever color from light bluish grey to black. But it also changes the price from over three bucks to under 3 cents each. The 5x5 right angle Technic brick is another en masse part. You need 16 in the odd color of yellow. Perhaps there was a bunch of construction equipment being produced at the same time as this set and this piece/color was already coming off the line. The color is unimportant in this build. Changing to black cuts off about a buck each so there's $16 saved. This drill can be run on several more parts. To make it a little easier, click on the Total column (likely twice) to get the most expensive at the top. The 1x16 Technic Brick can be changed to black, the 1x1 cone should become a 4589b, the 4x6 Technic Brick can go light bluish grey, and if you dare, the 3L Technic Pin can go blue. Some items like the standard bricks and plates should probably not change. At this point it's probably tempting to find an alternative to the 8x8 plate, 2x3 plate, 1x8 plate, and 1x16 brick. But the point of this drill is to get a 10179 on the cheap, not a Rainbow Flyer. 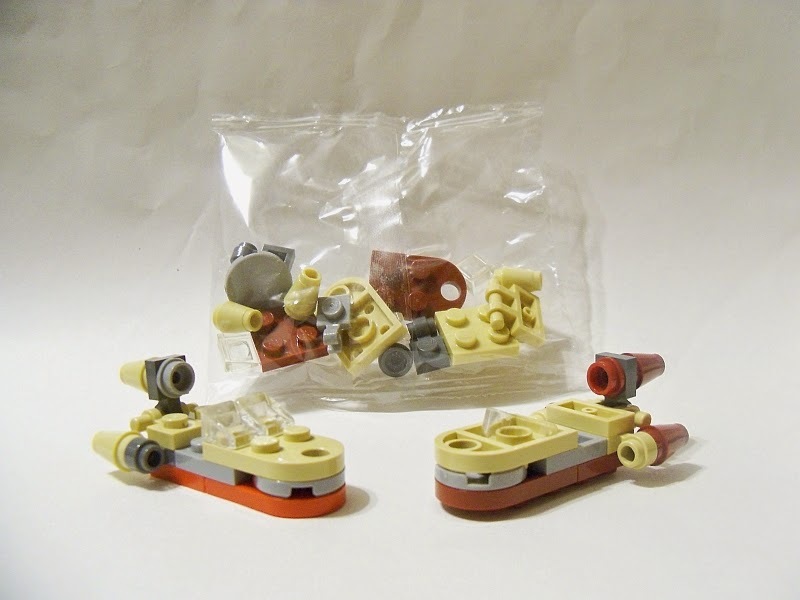 By default, all pieces come into BrickStock as New. Right now your total will be somewhere around $1100. For curiosity's sake, go Edit -> Condition -> Used and redo the Ctrl-G. The price now drops to somewhere below the $800 range. Add 12% for shipping and you're still under $900. At this point we've picked most of the low hanging fruit. The price is now about 1/3 of what it was previously. You're on your own to find more corners to cut. Whenever you're happy with your modified inventory, you can export it to a Bricklink Wanted List. Select All and go to File -> Export. This will copy all of your items in XML format to the clipboard. 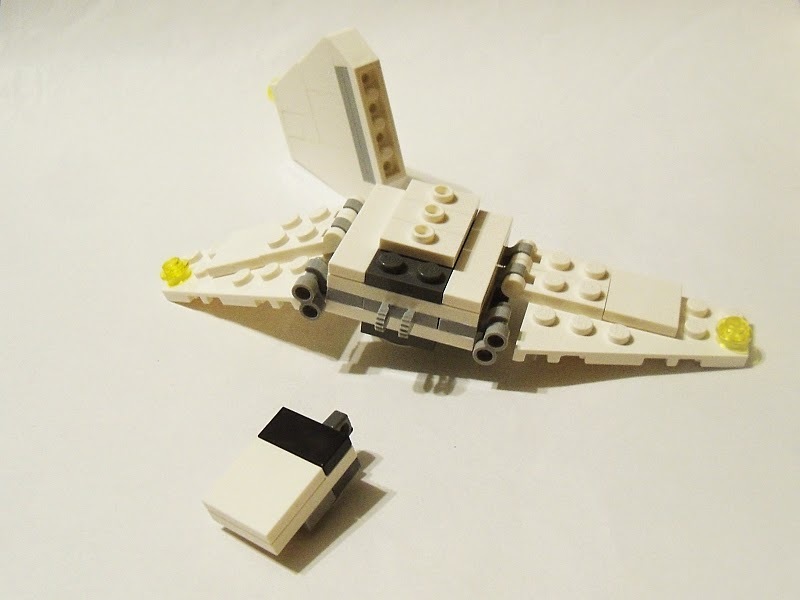 Enter Bricklink or BrickOwl and paste this in the appropriate spot. 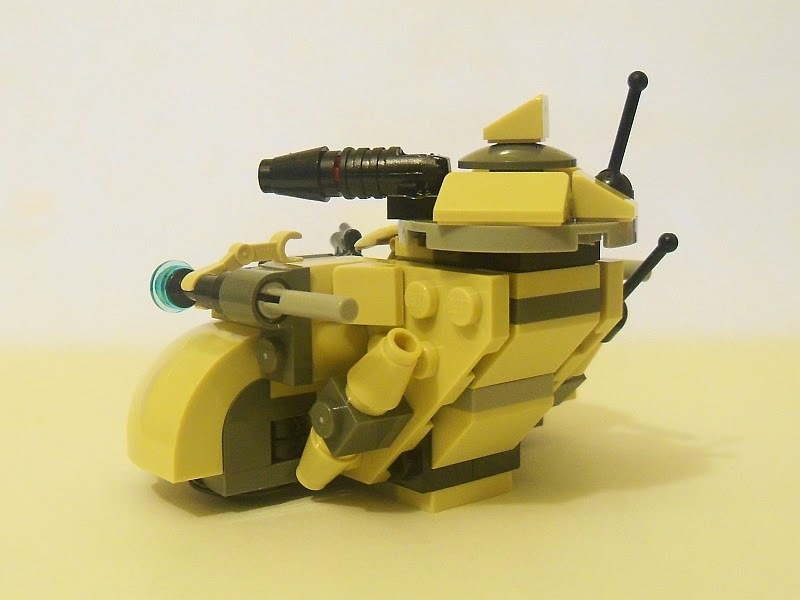 On Bricklink I would start with the rarest and/or most expensive pieces. Find a few stores that have it (and shipping) for a reasonable price. See what other parts that store has and add them in. Pick the winner for your preference of best cost vs. most parts. Then start with the next rarest or most expensive piece remaining and keep going. Even if you end up spending 20% more on pieces you could save a bundle on shipping. BrickOwl has a much more automagical tool that will show which stores have what and let you select them. Your wishlist and ideal stores will be updated in real time with the remaining pieces. You can always undo and reselect different options before purchasing from all the selected stores. Bear in mind there are a couple of other items that the completist would want. One is a box for $300-500. The other is the instructions for $300-400. We never considered these in the above so it's not another expense to deduct. But you still need to build somehow, right? 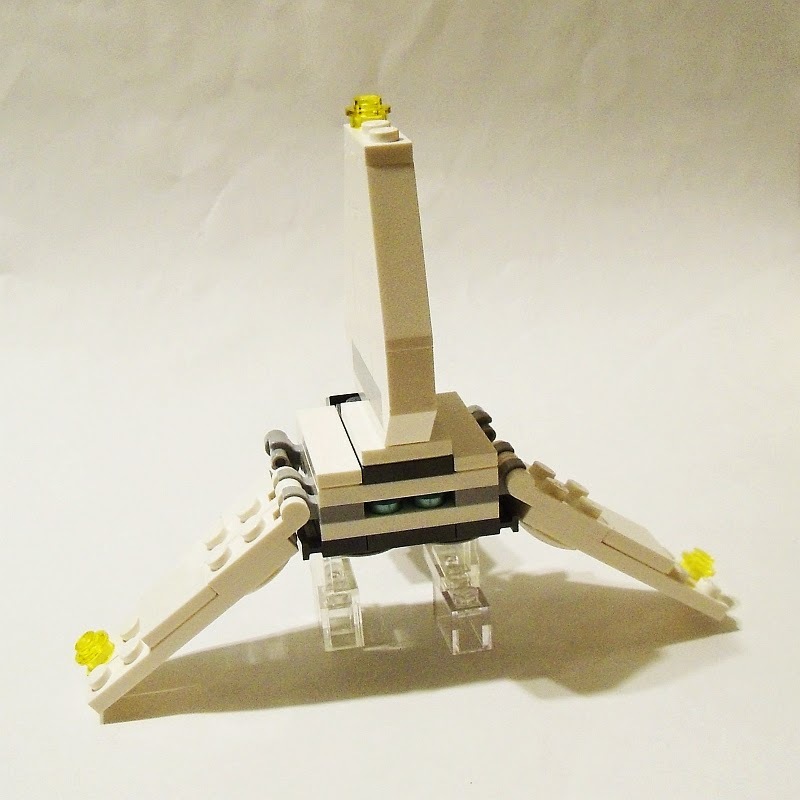 Did you know if you visit the LEGO website that you can find instructions? Type 10179 in the search bar and you'll have the opportunity to download a pdf file. To get your shipping costs down even further, you might consider using Brickficiency to help you find the least amount of sellers who can satisfy your epic wanted list. You can load a Brickstock .bsx file to it and it will automagically figure out what to buy from whom. However, Bricklink has added this functionality directly on their site. Good luck with your build! For more great tips, visit the Brickset Forum where there's an ongoing discussion. 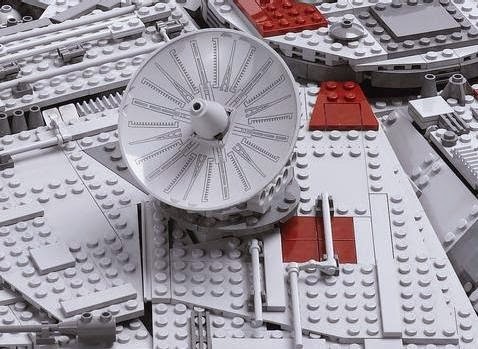 I'd love to know how cheaply you built your UCS Millenium Falcon for! Sound off in the comments below. N.B. 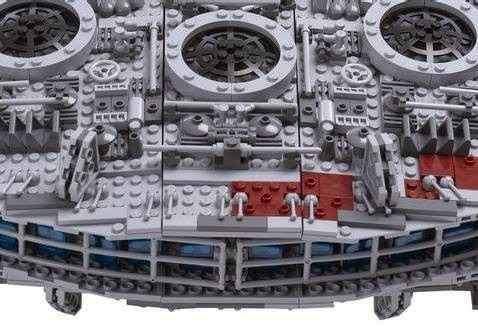 With the recent release of the Millennium Falcon 75105 you might be tempted to buy one or two to harvest parts from. Seems legit, right? You could use the inventory comparison tool on Bricklink to find that there are 66 lots that are the same. But if you are willing to make appropriate color swaps (hidden pieces, light vs dark bley), there are more like 120 usable lots. Even better, it looks like almost half the inventory of the 75105 is in your favor. After a rather in depth BrickStock session, it appears that the value of usable parts from the $150 set is $64 which replaces $95 of needed parts. By purchasing 3 of the 75105 (at $450) you can replace $286 worth of parts. It's possible a number of other parts would work as well. The good news is that as of this update, the minifigs have a value of about $90 $48. So $286 worth of parts plus $270 $144 remuneration on the figs equals $556 $430 worth of value for $450. Call it a wash at regular price but the shipping is free and you don't need to make any more than two orders to get all those parts. Plus you'll have a crap ton of parts left over, some of which may be worthwhile. If you run a store, no problem. 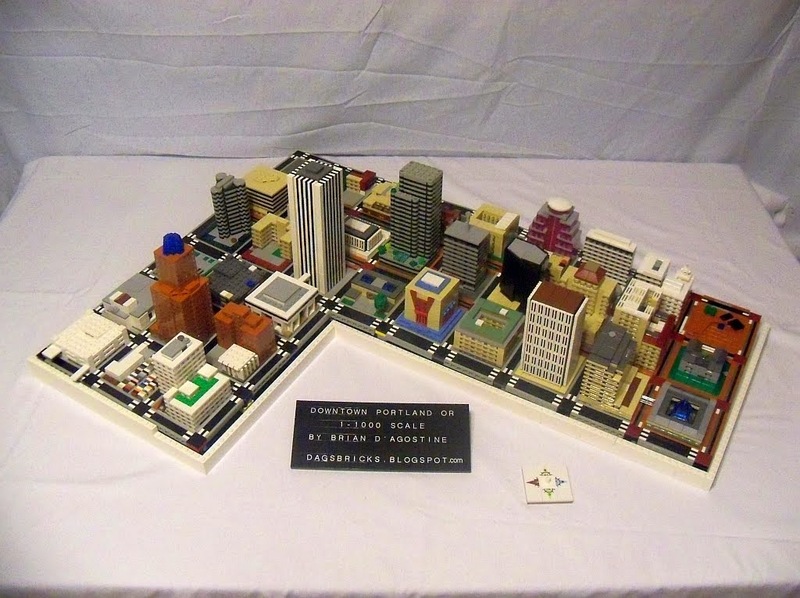 If you're an avid builder, cool. But if you just want to rebuild a 10179, it may or may not work for you. And hey, don't forget to check out my latest project, BRIX! There are surprises all over the place. You just need to look. Sometimes you don't need to look, they just happened. Such was myself visiting Toys'mirrored consonant'Us twice in two weeks. Unprecedented. 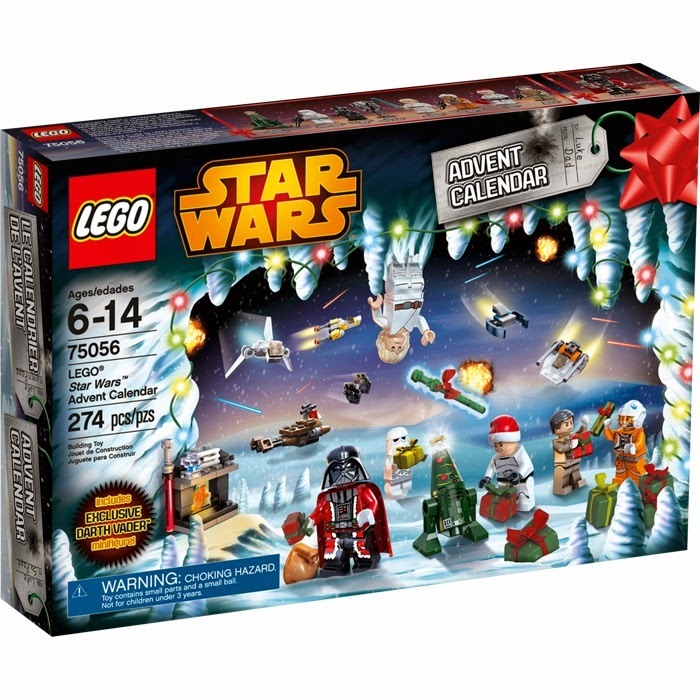 Second was scoring LEGO items at or below MSRP. Last week's Spida Glida was essentially free, this week's poly was a low $3.99 (even though I swore the shelf tag said $4.99). Quality of the build was another surprise. The last many reviews have not been amazing in quality of build though they are adequate and perhaps even interesting. 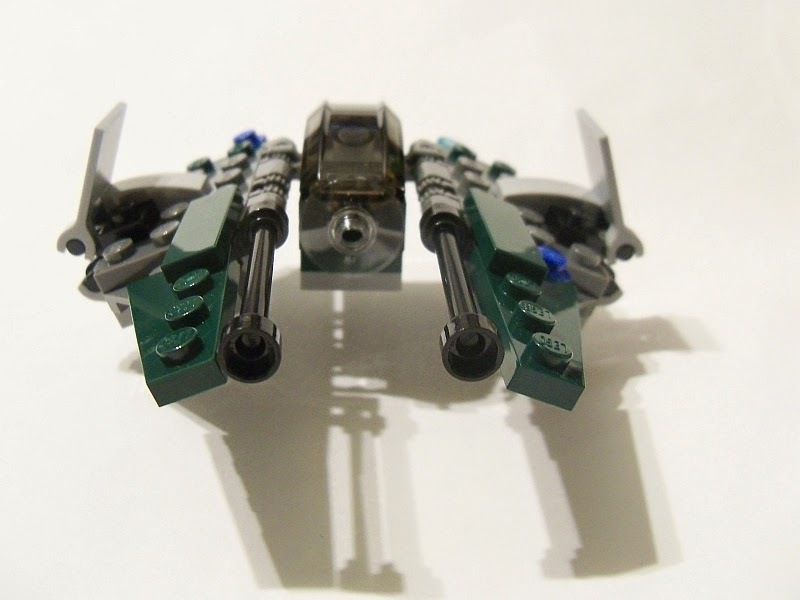 But this mini Jedi Interceptor was tops. The cat's meow, the bees knees, the, uh, Rancor's bite. When reviewing these sets, there are several things I look for. First, how does it compare to the source material (if there is source material). Some things have no source material or use the source material as if it were a chemical induced haze in a foggy dream. In this case, the source material had a little problem with the Gamma setting. All the toys and screen caps showed a yellow craft, though there were a few dark green ones. By and large though, the full size set was well done and this mini did a fair job as well. Second is the build quality, techniques, etc. This was a fun build. There were no major breakthroughs in the build and quite a bit was accomplished without printed pieces. Even minor bits such as the R2 head sticking out of the droid socket was paid attention too. There is a click hinge connection that I thought would be wobbly but it is very firm and the set does not fall apart when it is fiddled with. Finally, the more ethereal question. How does it make me feel? How does it appeal to the senses including the fun factor. Is it swooshable? Is it functional? Does it look pretty? Really, these are sort of factors of the first two points. Nonetheless this is a more holistic approach at the set. Regardless of its unquantifiable nature it still got high marks. But how to score this? On a scale of one to five internets it got 3 karmas? On all points, this little set was very pleasing. The craft was recognizable, the build was fantastic and the final product was very appealing. The price point is certainly acceptable. For 45 + 2 pieces the value actually lands around less than 9c per part (depending on your tax). I give it 3 Jedis and a Wookiee. 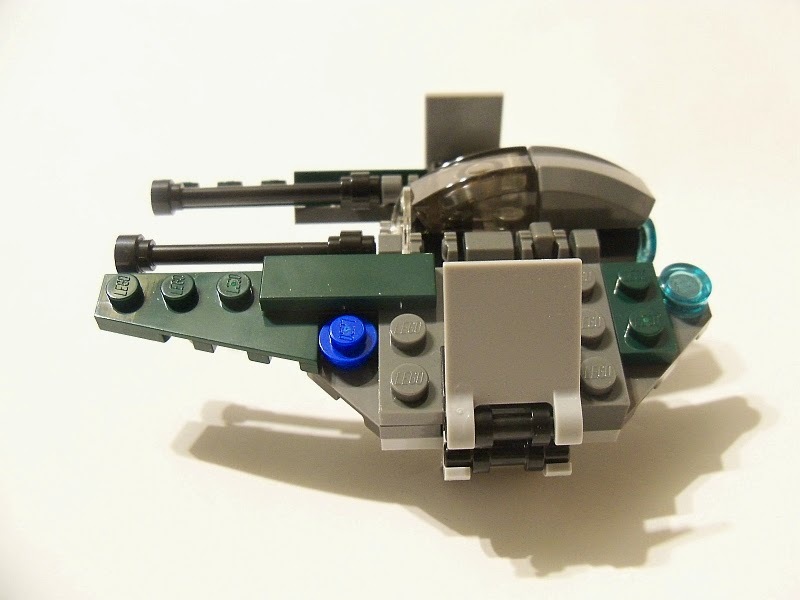 Thanks to reader Brad for leading me to discover that this is actually a slightly updated version of a 2005 set, Jedi Starfighter 6966. Apparently I was completely oblivious to that fact. This week was all about ups and downs. I had found an amazing raised baseplate in perfect condition. I stuck it in my box and rooted through some other bins. I came back to find that someone had yoinked it from my box! Gar! Very disappointing. At least I ended up with a Taun-taun. 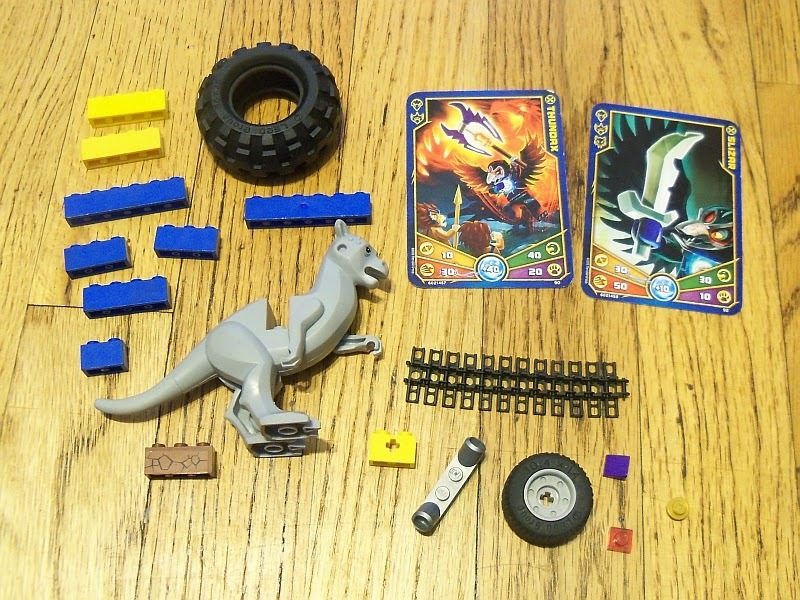 And some tires, VERY used bricks, technic links and some Chima cards. At long last, we've reached the end. My goal was to start the reviews of the Microfighters with an awesome set, finish with an awesome set, and bury the rest in the middle. Overall I'd say I succeeded. 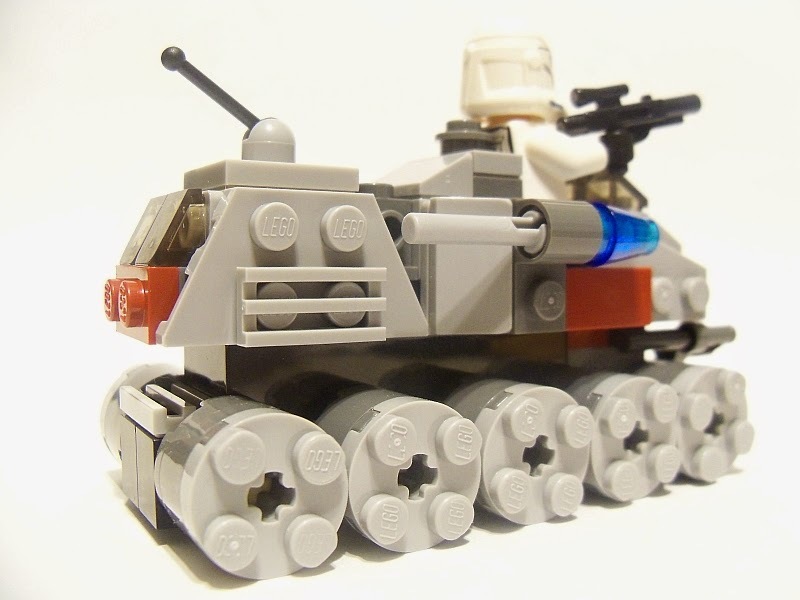 The Clone Turbo Tank is a set that we haven't seen in a while. The 2005 release was pretty cool. Then it went downhill. In 2006 we got a slightly awkward looking micro version. Then in 2010 was the even more awkward spindly thing that looked like a Chinese knockoff of a Hasbro toy. Now we got another micro. I figure at this rate we'll get a full size re-release sometime around 2021. Assuming TLG hasn't run out of new stuff with VII-VIII-IX coming around. 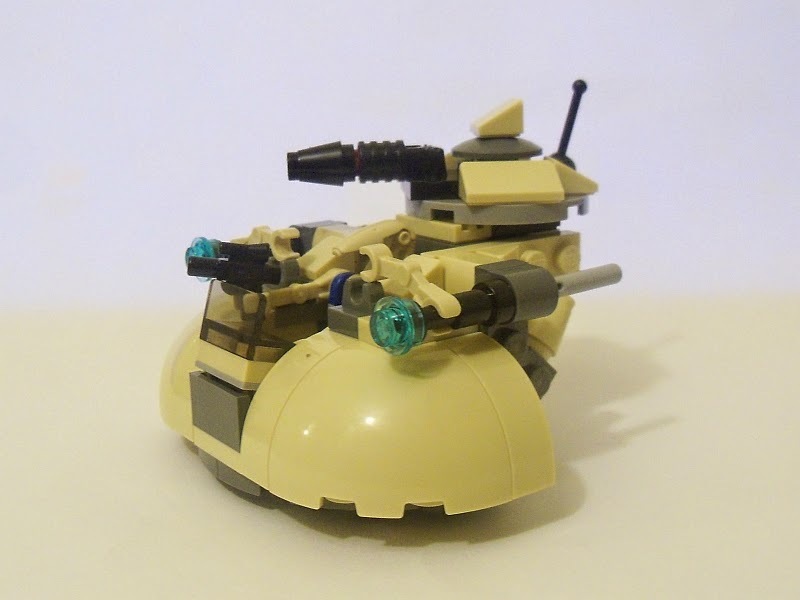 The Microfighter Clone Turbo Tank (CTT) is a very sturdy little vehicle with one design flaw. No steering. I'm frankly a little disappointed. 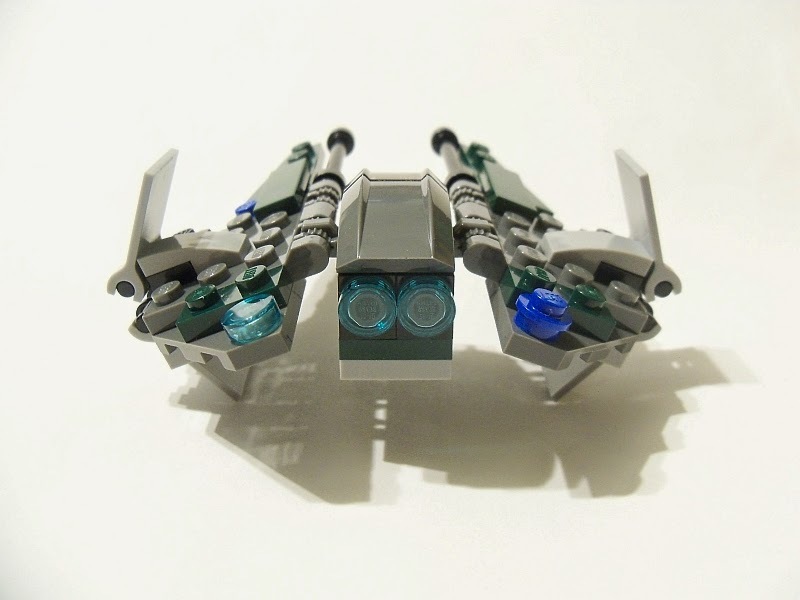 The main carriage is created with two 1x10 technic bricks. I would have preferred the rear six wheels be stationary with this setup while the front four get their own independent platform on a turntable. The build itself has all of sorts of SNOT. Pretty neat way to get the exterior texture and variation. At one point you place a headlight brick and a bracket next to each other. The side studs become exactly one plate of thickness apart. It was just screaming for something cool. Instead the headlight brick was left untouched. It could have been a normal brick and not lost anything. I checked some source material and was reminded of the size of this thing. At 64' wide, 162' long and 100' tall this could crush several houses at once. It even dwarfs the AT-AT (camel walkers) which are only 66' long and 74' tall. The CTT can cruise at 99mph which means it could easily overtake the 37mph AT-AT, crushing it like a melon without even noticing. 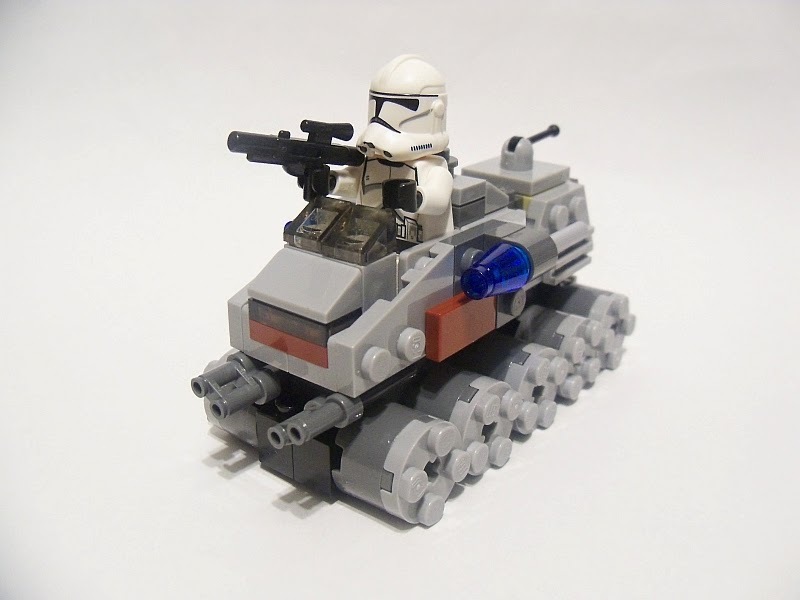 I have to wonder how the clones, with their wheeled vehicles were not able to keep the Empire from taking over. Or rather (as I understand it) how the Clone vehicles degraded even more to clumsy walkers when it became a key part of the Empire. Er, but you were here for a review of a set, not my commentary on the Clone Wars. Yeah, it's cool. Even though some of my fellow bloggers give it no love, I'd pay full price for it, flick-fires and all. Moving along again in the Microfighters subtheme of Star Wars, we come to a very large couch straight from the 70's. This comfortable settee features a windscreen, turret, and dual flick-fires. The color is a beautiful tan Naugahyde. Wait, not furniture? But it looks like an overstuffed sofa! I wondered about the weaponry bits. In that case, I suppose this will be a very different sort of review. I wanted to dislike this set. I saved the AAT for near the end of the series, partly because it came from the I-II-III trilogy but also because it didn't appeal to me. But now that I've built it I like it even worse. There are a few minor building techniques that are nice. The 1x3 curve top arch over the 1x2 curve top brick is a neat little maneuver though it was more of a necessity. The 1x3 curve top brick has not yet existed in tan and apparently running a new color through the mold was not worth it. That and perhaps some extra connections were preferred. It was also refreshing to see a straight stacked connection at a 45° angle. On the sides some sort of greeblies use standard bricks but they are turned on the stud. The ubiquitous flick-fires use telescopes on the ends which as far as I know is a first. Beyond that I find this to be a weak set. The telescopes pop-off of the flick-fires and the flick fire bases are not well secured. The turret on the top is very loose and would have benefited from some sort of clicking turntable. The gun uses a red 2L axle in an otherwise black assembly. Don't they still produce black axles? And shouldn't the gun be grey and tan anyway? Oh and there's a new droid *yawn*. The bright side of this set is the tan quarter round domes. Apparently these pieces were important enough to produce in tan for the first time. They might come in handy for my little Micros Eisley Cantina if I can ever get around to finishing it. At $10 for 90 parts and a battle droid I might otherwise pass. Maybe at 20% off I'd consider it. The series collector is going to buy it no matter what but for the rest of you, I'd check into a bedroom set first.